Here's the video of Arizona Cardinal QB Derek Anderson getting angry at a media member for asking him why he was laughing during the blowout loss to the 49ers tonight. Here is the video of the fight between Andre Johnson and Cortland Finnegan in the Texans vs. Titans game yesterday. They take each other's helmets off and start punching each other. Watch this video of Lebron James bumping his coach during the Heat vs. Mavericks game lsat night. Here's a hilarious video of Minnesota Timberwolves' Kevin Love and Wesley Johnson trying to hi five each other and shake hands during a game. 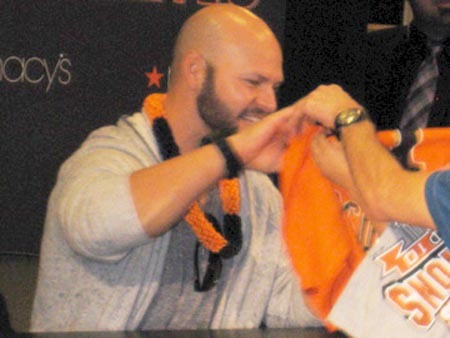 Below are 8 videos of Cody Ross getting the rock star treatment from Giants' fans. Ross was at Macy's Union Square Friday afternoon from 12:15pm to 1:45pm. There was a short Q&A session with KNBR's Brian Murphy in the beginning. The first 300 fans who wanted an autograph had to spend over $25 in Giants' merchandise in order to get in line. Ross was very nice to everyone and had a big smile during the whole event. I talked to a guy who went to high school with Ross in Carlsbad,Mexico and he said that Ross was hitting long homers in high school. He also said that Ross is very nice and humble. Ross signed t-shirts and hats, hugged women, and shook hands with Giants' fans. I took a lot of pictures and video footage from the event and today my shoulders are sore from holding up my camera for almost two hours. There will be more videos and pictures soon. A very cool San Francisco Giants World Champions t-shirt from the very hip and trendy clothing line KNOXX. 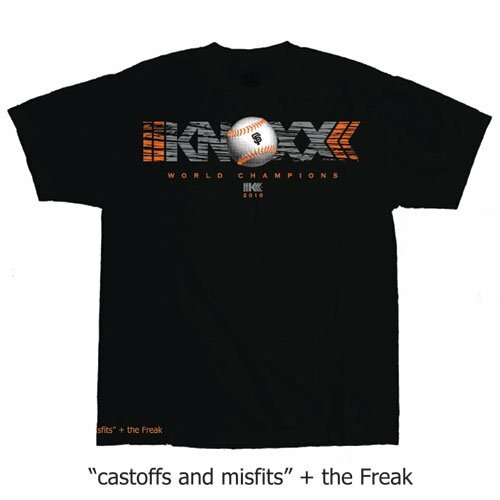 You can purchase this t-shirt here.